Being in media, and just a TV lover general, I pay extra attention to promotions for TV programs. There are so many new (and old) shows I am looking forward to this fall but this may be the one I’m most excited about. Boardwalk Empire just premiered its second season on HBO and the TV giant has done something major to promote the prohibition era set series. HBO has partnered with New York’s MTA to put an actual 1920s subway train back in service on the 2/3 line during weekends this month to promote the season 2 premier. 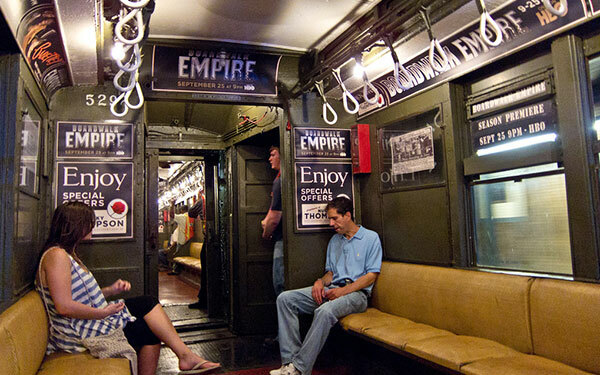 The train car will feature “authentic details such as rattan seats, ceiling fans, and drop sash windows” – and, of course, Boardwalk Empire ads. No word on the cost of this massive promotion, but I think it’s a pretty clever idea. I would definitely rather take a ride on this train than see another X-factor promo. Move over, Simon Cowell.